You can make your stringing projects more interesting by choosing a theme or a story to tell. 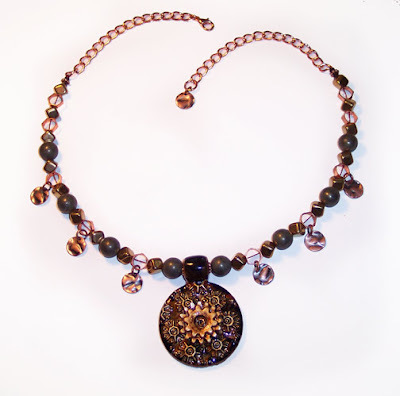 Mental Gears is a steampunk style bauble on a "heavy metal" strand of beads, featuring real pyrite, copper, and bronzed glass. The copper chain and hook make it adjustable, from 16-1/2 to 20-1/2 inches. The central pendant is polymer clay, fashioned by Amy E Fraser, painter and polymer clay artist. 1. Gather up a selection of beads and charms (optional) that you feel help to tell the story of your focal piece. 2. Use beading wire to string this central section, leaving several inches of extra wire on both sides. 3. Use crimps to attach the wire around some chain on both ends. 4. Add a lobster claw clasp (or other style clasp of your choosing) on one end and add a small dangle to the other end with a jump ring.